So my buddy Matthew Brazle and I caught the IMAX screening of Raiders of the Lost Ark last Wednesday. Here’s how I would describe the experience. You know how people ask you questions like “If you could go back in time and witness one thing, what would it be?” and then you spend like 1-75,000 minutes mulling it over, thinking of all the great things you wish you were there for? And then you eventually land on something like “I wish I was there for the signing of the Declaration of Independence?” Well, if someone asked me what one movie I wish I could’ve watched in the theater during its original run, Raiders would be on the short list along with Star Wars, Jaws, the Godfather, Rocky, Chariots of Fire, and Hoosiers. And Breakfast at Tiffany’s. (Just kidding – I tried watching that once (because I think Audrey Hepburn is kind of foxy) and couldn’t bring myself to watch beyond 7 minutes.) So getting to see it in IMAX was a complete dream come true. It is the same great movie we all know and love except on a GIANT screen with super clear visuals and fantastic audio. What made things even better was that we went to the Warren Theater’s IMAX room which holds 550+ people and there were maybe 20 total people in there. So, it was almost like catching a private showing of one of the greatest adventure movies of all time on the greatest possible audio/visual setup of all time. Normally I write about movies in the context of “whether you should see it or not”, but with Raiders, it’s a no brainer – if you haven’t seen this movie, you should. It is funny, exciting, educational, thoughtful, and even clean enough for families to watch with kids. It is basically one of the most perfect movies ever made. See it. But how can you get a copy to watch? That, indeed, is the catch. The recent theatrical re-release happened in conjunction with the impending release of the film on blu-ray, which is great since most of the Indiana Jones series will be absolutely incredible on blu-ray. 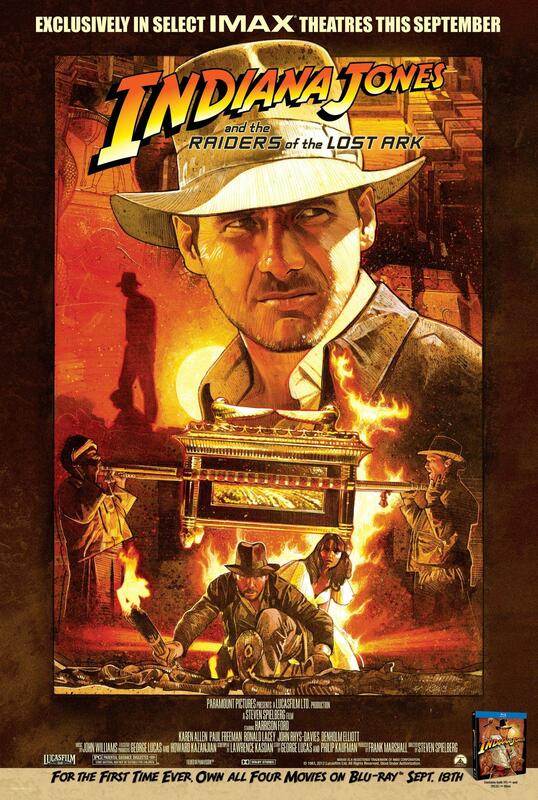 Unfortunately the blu-ray will only be available as a box set of the entire Indiana Jones series, meaning that if you want to get Raiders on blu-ray, you have to spend money on the antimatter that is Kingdom of the Crystal Skulls. Ugghhhh that “film” is such a piece of poo poo. It is literally the worst compilation of moving pictures ever. Not figuratively – literally. Like, I once tried to take a picture of myself and a girl I was on a date with with my iPod, and instead of taking a photo, I accidentally started recording a video. The result was a jumbled, smeared, eight-second video of me trying to get the thing to stop recording. My point is, my eight-second video is an exercise in creating actual complete garbage, and it has more validity as an artistic statement than Kingdom of the Crystal Skulls. So here’s my question: would you pay $65 for Raiders, Temple of Doom, Last Crusade, and my eight-second home garbage-fest?? If you answered no, then here’s my suggestion – skip the blu-ray release until you can skip Crystal Skulls. Your money is too important to waste on poor movies. Instead, see if you can rent a copy on Netflix or at the local Family Video. Or, if owning is your thing, then see if you can snag the 2003 Indiana Jones DVD boxed set, or in a pinch, the 2008 DVD boxed set (although I have to warn you, I own the 2008 boxed set, and it is 28% more horrific since most of the “Special Features” are geared around promoting the upcoming bowel movement that would be Crystal Skulls). Okay, so, the movie is great, seeing it in IMAX is great, and you’re going to skip the blu-ray release and watch it on DVD until we are free to purchase the original trilogy sans Crystal Sculls. I just have a couple more things to say and the lesson is yours. First, remember how I said the sound was great in the theater? Well, it was mostly great, with three exceptions. At three points in the film, there were very noticeable anomalies in the sound mixing, and I am not sure as to whether those are due to the clarity of IMAX or due to a rushed mix. But, there were definitely three moments in which the sound was wonky. Like, when Marcus Brody tells Indy he has the greenlight to go after the Ark, Indy gets fired up and pours himself and Marcus two glasses of champagne. They “tink” the glasses together, and the “tink” is distinctly quieter than expected. Also, there’s a moment when Indy is doing something outdoors (I don’t remember the exact moment), and there was a super annoying insect sound that was coming from the right rear sound array. I don’t remember that sound sticking out in my home viewings. So, I’m curious to find out if the blu-ray has the same jankyness. Second……I think the Indiana Jones series missed its calling. Obviously I love the original trilogy, but I really think this series would have been perfect as a high quality, high-production-value cable television series a la Madmen or Game of Thrones. I think Indiana Jones is the perfect adventure character, but I can’t get more, and that saddens me. I suppose Spielberg could make the choice to go “James Bond” on us and introduce a new, younger actor as the titular character, but, at this point, that would be lame. And I’ve given up hope for a well-done “late life” Indy story after the Kingdom of the Crystal Skulls disaster. So, I’ve taken to mining for Indy novels in search of good stories to sate my appetite. But, those are also fairly few and far between. So, here’s my actual last thought. I really, really, REALLY hope the Uncharted movie happens. In case you are unfamiliar with Uncharted, it is a video game about a treasure-hunter, and it has the same adventure feel as the Indy series. The stories always revolve around finding some cool artifact or another, and they’re really good, so the series would be a worthy candidate to carry on the archaeological adventure torch. Furthermore, I hope Nathan Fillion gets the nod to play Nathan Drake. I’ve always thought he is the one current actor who possesses that old-school, Harrison Ford/Clint Eastwood, tough guy, leading man quality, and he would kill as Nathan Drake. Surely Hollywood can pull this off successfully. I also hope that while Uncharted movie after Uncharted movie is being made, the brand is spun off into an History Channel series with the same cast, and that the show lasts until Fillion can’t get out of his wheelchair anymore. By the way, all this writing about Uncharted and Indiana Jones has me CRAZY fired up about treasure hunting. In fact, I’m so fired up right now that I just discovered El Dorado and the Fountain of Youth! Alright, enough of this. Quit reading, get out your bullwhips and go swing across a ravine for goodness sakes!! Raiders is glorious. Even moreso in IMAX. NOTE: Just ignore the advertisement at the bottom of the poster. DO NOT own all four movies on blu-ray. Grant Stevens is a freelance writer who certainly writes for free but who possesses not even one functioning lance. Nevertheless, he is on the fast track to winning multiple Pulitzer prizes, the Hugo award, and the Presidential Medal of Freedom. While not writing he writes music. Check out his goings-on at www.grantstevensgroup.com or follow him on Facebook. Fun review,Grant! It has inspired me to hunt down an old Indiana Jones movie sitting around the house somewhere and watch it! That’s great to hear! Hope you have a fantastic time catching up ole Indy!